Dr. Wendy Wood is Provost Professor of Psychology and Business at the University of Southern California, where she teaches classes on behavior change. Given her research over the past 30 years, she is widely considered the world scientific expert on habit formation and change. She has published over 100 articles, and her research has been supported by Proctor & Gamble, National Science Foundation, the Templeton Foundation, and the Radcliffe Institute. She has a forthcoming book with Farrar, Straus and Giroux, Good Habits, Bad Habits. Dr. Wood is a popular speaker at scientific conferences and with a broad range of professional groups. In 2018, she gave the inaugural address in Paris for the Sorbonne-INSEAD Distinguished Chair in Behavioral Science. Her work has been featured in The New York Times, NPR, Washington Post, on radio shows like Freakanomics, and in podcasts like the People’s Pharmacy. 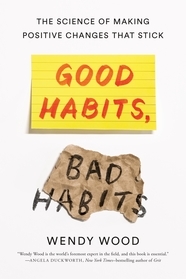 A potent mix of neuroscience, case studies, and experiments conducted in her lab, Good Habits, Bad Habits is a comprehensive, accessible, and above all deeply practical book that will change the way you think about almost every aspect of your life. The Science of Exercise, Diet, and Getting HealthyWendy Wood gives a clear, entertaining guide to the basics of forming healthy habits and breaking out of unhealthy ones. Transit Habits: Changing the Way We Get Around Drawing on her book, Good Habits, Bad Habits, Wendy offers a science-based analysis of how to get people out of their cars and using active transit. New Products: It's Not What Consumers Think, It's What They Do A clear, science-based framework for understanding when consumers will embrace—or reject—new products and services. Benefits of Life TransitionsWendy draws on her book, Good Habits, Bad Habits, to offer an inspiring take on how to turn life disruptions to your advantage. Self-Control ChallengesLearn science-based strategies for changing behavior and making it stick. Read Dr. Wendy Wood’s research on forming and breaking habits. Freakonomics Radio featured Wendy Wood’s research: How to Launch a Behavioral Change Revolution. Listen to People’s Pharmacy Show as they featured Wendy Wood’s advice for trading bad habits for good ones. Daily Mail featured Wendy Wood shares how stress can trigger a healthy behavior.